You may have heard about Forex trading through friends or seen an advert to open a trading account online. This does not surprise me because it has become very popular. One of the most common questions that follows is; What is Forex trading and how does it work? Since this is a two part question that usually go hand in hand; First I will answer the question, what is Forex trading and then how does it work? I will do my best to give you a comprehensive overview and understanding about the subject. According to the bank of international settlements, about $5 trillion was being exchanged on an average day in 2016. That’s a huge amount of money isn’t it? Well, volumes were rising prior and will probably be even more now. Trading volumes are probably going to continue rising in the future too. The reason is very simple, economic growth is a primary objective for corporations and governments across the globe. International trade will always be on their agenda to achieve that. Also, the world is moving more towards globalization than away from it. Forex is an abbreviation of the two words, foreign exchange. Sometimes it is just referred to as FX, and this is why I included it in the name for this website. Forex is an over-the-counter market (OTC) because there is no central exchange from where currencies are traded. Unlike the stock market, where there are central exchanges to buy and sell shares in companies. As a matter of fact, if you combine the trading volume of the world’s stock exchanges, it would not even come close to the sheer amount of volume being traded in the Forex market. The Forex market is also open 24 hours a day, 5 days per week. As long as there is a bank open in the world and currency prices are being quoted, you can trade them. If you have ever traveled to another country, you may have already participated in a foreign currency trade. In most cases you would have had to in order to be able to buy goods and services while staying there. Then on your return home, you might have exchanged whatever remained back to your original currency. Currency prices are always changing and depending on what the rate is at the times of each exchange, you can receive a better or worse price for the currency. Forex trading is simply the buying and selling of foreign currencies to try to make a profit from the changes in their exchange rates. Forex trading is always done in pairs; one currency is sold to buy the other. Whenever you engage in foreign exchange transactions with the sole purpose of trying to make a profit, you are speculating that the price between the two currencies will either go up or down. Forex trading provides you with opportunities to potentially make a profit from rising or falling prices. You may already be familiar with the money exchange bureaus found on the high street or at the airport. However, Forex trading is done through a specialist online Forex broker at inter-bank rates. The difference is like buying from a retailer of currency or a wholesaler of it. Since it is done online, trade executions happen in milliseconds. In this way, you can enter and exit the market quickly to take advantage of even the smallest of price movements. Trading through a specialist online Forex broker also allows you to trade on more competitive pricing and using leverage. I will elaborate more on the concept of trading on leverage a little further down. Now that you know what Forex trading is, let me explain how it works and give you some examples to help you understand it even better. All markets work on the basic economic principle of supply and demand. Supply and demand exists in every market where buyers and sellers meet to make transactions or exchange goods or services. The market could be anything from potatoes to the employment market for certain skills. In this case, we are talking about the currency markets. When demand for a currency exceeds the supply of it, the price should go up. The same can be said when supply of a currency exceeds the demand for it, the price should go down. The price of a currency can also go down due to a lack of demand for it and it can also go up momentarily until supply for it is found. Buyers might be less willing to buy, or buy in smaller quantities at higher prices. They might be more willing to buy, or buy in larger quantities at lower prices. The inverse can also be said for sellers. The price for currency is continuously changing from one moment to the next until an equilibrium is found. 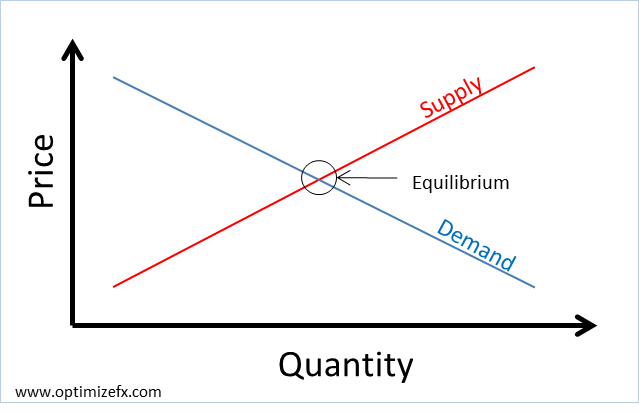 This is where price is determined for an equal quantity of supply for demand. Then the process repeats itself because supply and demand is always in flux, which creates imbalances in the currency markets. It is because of these imbalances that the potential exists to make a profit (or loss). What creates supply and demand in Forex? Supply and demand is created by the participants of the Forex market. Also from the price itself, which can induce and motivate them to buy and sell. It is like a self-perpetuating system with internal and external influences. The internal influences could be something like the price momentum. Isaac Newton’s first law of motion states that an object in motion will remain in motion until acted upon by an external influence or force. Price can be that object and the force can be sellers thinking that the price is too high. The external influences or force that can slow or change the direction of currency prices could be economic news or political events. This changes traders perceptions about the future value of currencies and motivates them to buy or sell. This also creates supply or demand. Whatever it is, whether traders think price is relatively cheap or expensive, their actions create buying and selling pressure. This pushes the price up and down. That’s simple enough to understand right? Let’s start with a simplistic example trading the Euro vs the US Dollar. The symbol for this currency pair is EURUSD and it could be trading at 1.30000. Currencies are usually quoted to 5 decimal places on online Forex trading platforms to give a more precise rate of exchange. Even the smallest price moves, or fractions of cents can mean significant profits or losses depending on how much you exchange. The first currency in the symbol (EUR) is referred to as the base currency and always represents one unit of that currency. The second currency in the symbol (USD) is referred to as the quote or counter currency. The price that follows represents how much of the quote currency can be purchased with one unit of the base currency. The inverse is also true, the price that follows the symbol represents how much of the quote currency is required to buy one unit of the base currency. For this example, this means that one Euro buys US$ 1.30000 or US$ 1.3000 buys one Euro. If you exchange or sell €1,000 you would receive or buy $1,300. Now imagine after some time the price changes to EURUSD 1.28000. You can now buy less US Dollar for each one Euro or you can buy more Euros for less US Dollars. In other words, the Euro depreciated in value relative to the US Dollar. Conversely, the US Dollar appreciated in value relative to the Euro. The difference is a US$ 0.02 appreciation in the US Dollar or a depreciation of US$ 0.02 in the Euro. This means that if you sold €1,000 to buy $1,300 previously, you could exchange the US Dollar back to Euros and make a profit. Since now, you would receive more Euros than what you started with. If the price went the other way by US$ 0.02 to 1.32000, the deal would be in a loss. Should you decide to exchange back to Euros and close the deal, the loss would be realized. You decide when to buy or sell. Don’t worry if this seems somewhat confusing for the moment, because Forex trading platforms do all the calculations for you. This includes your profit and loss. If you think the price is going to go up, you buy the symbol or currency pair. If you think the price is going to go down, you sell the symbol or currency pair. Below is a screen shot of a basic price chart from the popular MT4 trading platform available at most Forex brokers. Where do you think the price is going to go next? How much room for error will you allow before accepting a loss? Would you like to wait for more favorable prices? These are the kinds of questions traders ask themselves. They also have many tools and techniques to analyze the currency markets to help them make such decisions. Whenever you decide to buy or sell, you must also choose an amount to trade, or how much to buy or sell. This is referred to as the trading volume and can be expressed as an amount or in terms of lots. Lots in currency trading are the unit of measure, like Kilograms’ can be for potatoes or liters for water. How many lots do you want to buy or sell? One lot is a standard contract that has a nominal or face value of $100,000. You can also trade in mini lots, which are 1/10th the size of a standard lot or $10,000. There are also micro lots, which are 1/100th of a standard lot or $1,000. The face value of the contract or one lot can vary depending on the base or quote currency in the symbol. Just to keep things simple and standardized, these are the amounts when pegged to the US Dollar. Since the minute to minute or day to day price fluctuations are relatively small, larger amounts are required to make Forex trading more feasible. A one or two cent price move on a $1000 deal size is only about $10 or $20 in profit or loss in real terms. Leverage helps lower the barrier to entry in to the Forex market. What leverage also allows you to do is buy assets of a much larger value than the amount deposited in your trading account. In return, you put up a smaller margin. This is a form of collateral deposit required by the Forex broker to open and maintain Forex deals. For example, using 1:200 leverage, allows you to open deals with a nominal or face value 200 times larger than the amount deposited in your trading account. So with a $1000 deposit, you could open deals worth as much as $200,000. Leverage varies from broker to broker and the regulatory jurisdiction. The benefit of trading using leverage is that you can magnify or speed up your potential profits from small price movements in the underlying asset. However, this also magnifies and speeds up your potential losses too. If the price moves in the other direction, you could lose in equal proportion. Forex trading involves risk, so it is prudent to only risk a small percentage of your account balance on any single deal. This will help with longevity and minimize any damage to your account's balance should any trade idea not work out. When trading small amounts, like micro lots, the amount at risk could only be a few dollars. It can also be a lot more when trading larger amounts. It depends on your lot size and how far away you place your stop loss from the entry or buy price. Before trading with real money, you should take the time to educate yourself. This will help you to make better informed trading decisions. Forex trading is more or less accessible to anyone from the age of 18, who can also provide proof of their identity and residential address. The process of opening a trading account is quick and simple and similar to opening a bank account. Everything is done online. Demo accounts are also available so you can practice risk free. So now you should know what Forex trading is and how it works.